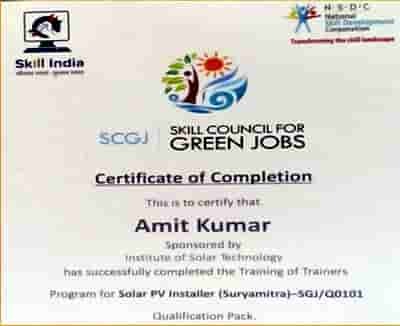 Institute of Solar Technology is only institute in India which provides Hands on Practical Quality Training right from basics of Solar Cell Technology to Design, Installation, Commissioning, Testing & Troubleshooting of Solar Power Plant. Today IST has trained numerous numbers of students from technical and non-technical background throughout Pan-India. "Institute of Solar Technology (IST) an ISO 9001:2008 certified academic and research-oriented & Entrepreneurship Development autonomous institution, a unit of Global Advanced Training & Educational Trust regd. under NCT New Delhi, Govt. of India, NITI Aayog (NGO-DARPAN) Govt. of India. Global Advanced Training & Educational Trust (GATE Trust) was founded in 2014 as a nonprofit educational organization to empower people, communities, and businesses worldwide.. !" 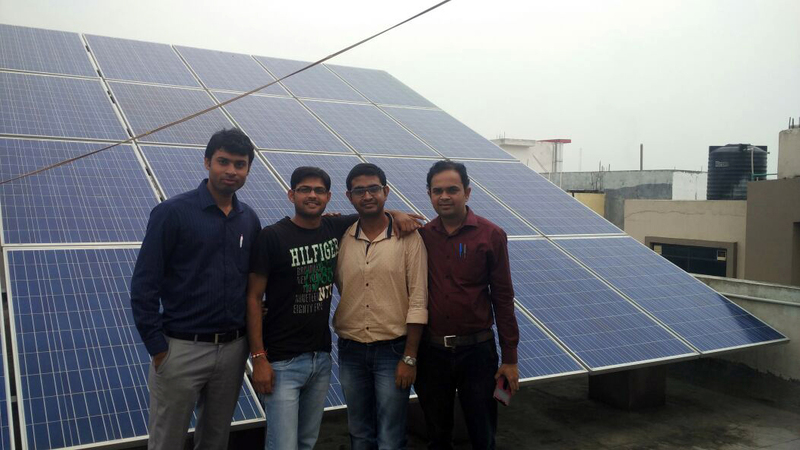 IST is listed among Top 10 Renewable Energy Training Institutes in India under NIWE, Govt. 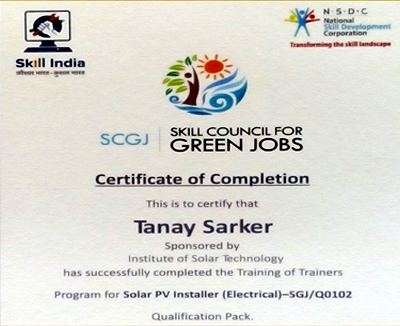 of India and also an organizational member of Solar Energy Society of India (Indian Section of International Solar Energy Society). National Institute of Entrepreneurship and Small Business Development (NIESBUD) under Ministry of Skill Development and Entrepreneurship, Govt. of India. Today, Entrepreneurship Development Program is one of the key elements for the promotion and start up of micro and small Industries/enterprises, contributing in Start-Up-India Mission. IST aim is to create employment for individual through entrepreneurship. Hence, entrepreneurship development has been one of the priorities in countries, the world over. The focus is on entrepreneurial development coupled with specific skills relating to PV solar sector, which enables the trainees to start their own ventures. Funds are required to start any business. In the solar business, your work credential is very important. If you can invest a bit, you can start installing solar power plants, you can earn less but there will be a lot to learn. Once you become a master in solar then you can invest money in the solar business. This can be a great opportunity to grow in the solar business. IST providing business support, project support for start-up Alumni. These days there is a huge demand for a solar installer. By becoming a service provider you earn according to your need. Get projects in your hands and see the benefits. If you are able to manage the work correctly you will be able to get good benefits. Create a good team and start this work with some required tools. You will need credentials to enter the solar business. By working on behalf of IST Project Partner companies, you will be able to understand the business well and using their credentials will also help you deal with customers. This is not a bad option for starting a solar business these days. There are many people working in the market as a freelancer. As a freelancer, you do not have to invest money. Just stay in the market and get the potential leads and work as Project consultant with IST Project Consultancy Support Unit. Marketing and promotion is essential for your business's survival and growth. IST providing various platform to promote IST Entrepreneurs business to the target customer. Internships are a great way to apply the knowledge from the classroom to real-world experience. Learning is one thing, but taking those skills into the workforce and applying them is a great way to explore different career paths and specializations that suit individual interests. 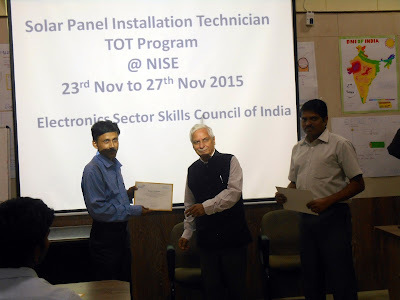 Institute of Solar Technology (IST) was established to provide practical skills and impart stronger work ethics among students through experiential learning and vocational training. With additional skill based training programs available, IST strengthens the local communities' overall human resource capacity through advance higher education, short and long term job oriented coursework. Such coursework includes formal and vocational training programs including the newly initiated Renewable Energy, mainly PV Solar Power Entrepreneurship course. 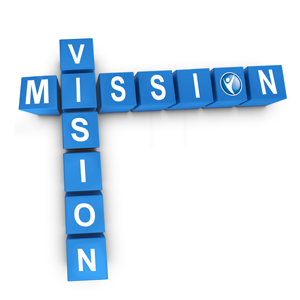 IST vision is to provide skill-based quality education to the youth all over the world. IST is committed to tackling the social challenges through crowd sourcing innovative ideas and solutions from the best and brightest skill development school as it leads social entrepreneurship among prominent Educational Institutions in India. Today IST seeks to address the grave need for skilled and motivated employees and entrepreneurs in the next generation of community and economic development. 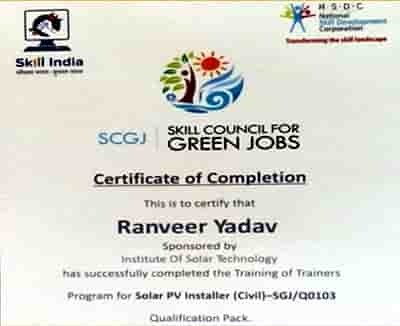 Our mission is to create awareness and remove darkness from the society and also to reduce carbon emission.Our aim is to accelerate the adoption of solar technology across the world to conserve our environment and provide an environment friendly, sustainable and conflict-free power supply.While driving for world-class Training and Consultancy Services, continuously improving the quality and environmental friendliness of our Training and Consultancy methodology are the core values of IST. We are committed to comply with international safety standards, environment and quality standards at all times. 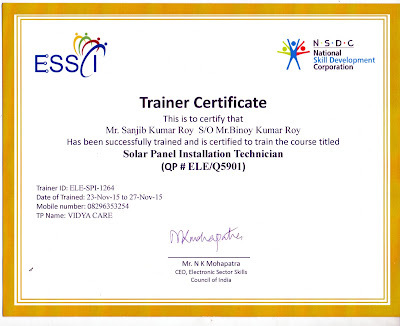 Laplace System Inc, Japan is the only Technology Partner of IST (Institute of Solar Technology) in India, which provides Solar PV Simulation software called SolarPro and Remote monitoring system called Solar Link to make solar power technology more effective and easier to achieve 100GW target. Rogress Techno Pvt. Ltd. is an engineering systems firm, have partnered with firms in Japan and Germany, to meet the ever-changing needs of the Indian Industry. Rogress Techno Pvt. Ltd. are now leading the way in providing Solar Energy Simulation and Monitoring systems, Textile machinery and components, Effluent Waste and Water management systems.